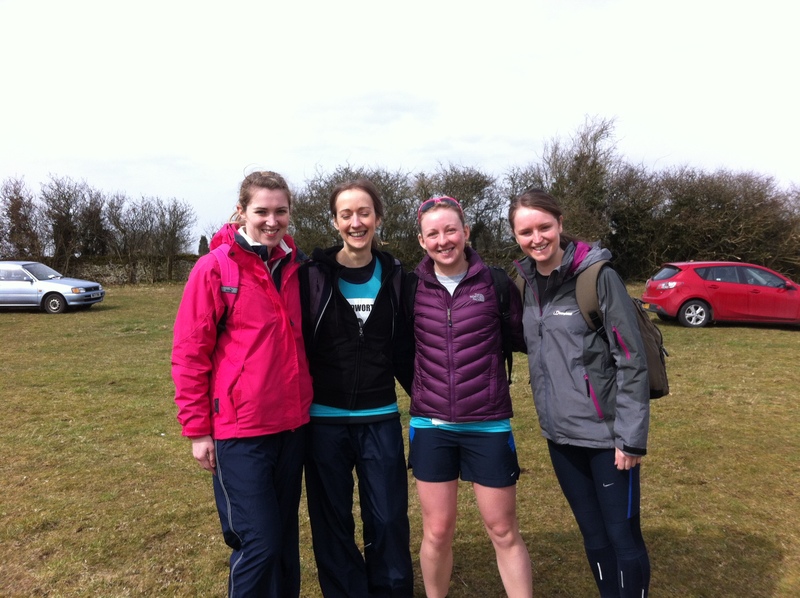 Fiona Heath-Brown reports: In preparation for the Edinburgh half marathon next month, Lizzy Bryans, Áine Gallagher, Jenny Walton and I decided to enter this 10-mile race down in Gloucestershire. Described as ‘a demanding 10-mile multi-terrain race in scenic Cotswold countryside’, we knew it wasn’t going to be an easy one, but were hoping to enjoy getting out into the hills away from the big city. The sun was shining as we set off, and I think we all enjoyed the first few miles of relatively flat bridal ways and farm tracks with beautiful views of the rolling hills. Having been lulled into a false sense of security from these first few miles, the race suddenly got a lot tougher. There were a couple of relatively short but steep hills. Then there was a river crossing….. I’m talking freezing cold water about a foot deep and five to six paces wide with mud either side. At least we all managed to stay on our feet though! Just after 7 miles we hit a ‘gulley climb’ complete with muddy water flowing down. Having read a previous Runner’s World race report describing this as a ‘one-in-seven gulley climb littered with stones and roots’, I knew it was going to be tough. However, I have to admit, I didn’t think it could be so hard that I would end up walking!! Having run my fastest mile at 7:01, mile 8 took me a miserable 10:52!! Two more similar steep hills meant that the ninth mile wasn’t much quicker and it required a huge effort to get my heavy legs to pick up the pace up for the final flat mile to the finish. After we had all finished and had a good moan about ‘that hill’, we had to admit it had been a challenging but enjoyable (?!) race. We also managed to come 5 th in the ladies team competition, so I think that the cakes, chocolate and roast dinner to follow were well deserved!! This entry was posted in 10 miles, Fell, Race Reports by BvH Admin. Bookmark the permalink. Great report, well done Fiona, Lizzy, Áine and Jenny! `When the going gets tough the tough get going`! Congratulations on successfully completing and being `well placed` in the ladies team competition.Good luck for the Edinburgh Half Marathon next month. Well done all of you, sounds like my kind of run. Congratulations on team position.